It’s been a week since the E Street Band left the stage after the final Australia tour date at Hanging Rock. So after struggling to get on with life, work and everything else in the past seven days I’ve compiled a list of the top ten things that made Bruce Springsteen’s Australian tour the unforgettable, incredible adventure that it was. I’ve avoided listing which show was the best for the very simple reason that it has been impossible for me to decide which night was the greatest. A great aspect of The E Street Band’s tour in Australia is that they didn’t come all this way for a standard show. From the opening minutes of Brisbane 1 (concerts on this tour are officially known by Bruce fans as the location, followed by its order) it was clear that Springsteen came here to make this the biggest, best tour Australia would ever see. He was clearly keen to banish the memories of the ill-fated, corporate seat raped, power failing previous tour for The Rising in 2003, and made sure that Australia wasn’t just a country taped to the Wrecking Ball Tour, it was the country that would help define the tour. 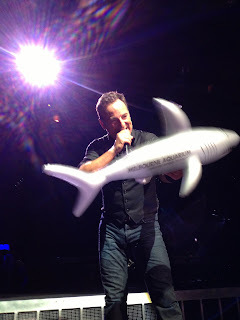 There were plenty of moments throughout that showed the band were here to have fun and earn the respect of Australians, but the line that they travelled across “shark infested waters” first surfacing during Springsteen’s introduction to Spirit In The Night, was the one that struck a chord with the crowd. By show three on the tour (Sydney 1) the crowd knew what was coming and shouted the words before he could get them out. He responded by asking those in the front how they knew that, then on following nights altered his speech to try and throw off the tour catchphrase-waiting crowd, and allowing the fans to voice the words instead. By the time he reached Melbourne 2, fans were waving inflatable sharks and stuffed shark toys with requests on. Previously I had seen Springsteen at stadiums in the UK and at the two Hard Rock Calling shows in Hyde Park. The two Hyde Park shows in particular were incredible. But the main difference was that the band was playing to more than 50,000 people, and on this tour no crowd was could have been bigger than 20,000. And the GA front standing area seemed no bigger than 1,000 every night. Until this tour I had felt that every E Street Band show makes you feel like you’re at a personal, intimate concert despite the thousands of others around you. But in the pit on the Australia tour and its limit on numbers meant that you really were up close with the band. Not just to strum the guitar in Born To Run, but also to watch how the band studies Springsteen’s every move to see how long they should play a song for, or with Tom Morello which section comes next. Not to mention Lofgren’s frustration when a guitar doesn’t sound right, or Soozie Tyrell’s tears to the tribute for Clarence Clemons and Danny Federici. The arena dates offered a close-up, personal glimpse of how the band works, something not always seen in the bigger concerts no matter how spectacular they can be. This song and the album of the same name, has never been my favourite and exists in my collection as one rarely listened to. But by starting Sydney 2 with this song not only to it reignite my desire to listen to the album again, but it also threw any predictions of what Springsteen would start each show with completely out the window. From that moment on any attempt to try and guess the first track of the night was met with the response that no one could predict what was coming after such an unexpected opener. Rumours are it was brought out for the tenth anniversary of the start of the war in Iraq, but what it gave everyone going to more than one show was even more excitement and anticipation for the setlists that were to come. Both the moment during My City Of Ruins where Springsteen introduces the band on stage and pays tribute to the ‘ghosts of E Street’ and anyone who is missing or missed, and to those crazy enough the addictive routine of lining up with a number on your hand to be front of the line when the doors open. The roll call from Springsteen was so poigniant that when he didn’t perform the song and introduce the band, setlist watches around the world went into meltdown and started Twitter conversations with those in the pit to try and work out why it was left out. And out in the street waiting in line for the next show, the GA roll call every 3 to 4 hours in the 30 hours leading up to doors opening became a regular aspect of life for people following the tour. It gave us a respite from waiting in line for 24 hours straight as well as move to the shade as the Aussie sun dictated. Most of all however it was a regular meeting of like-minded Springsteen fans who understood why you would spend hours of your day sat outside an arena in a bid to be near the front for the greatest show in the world. I first heard of this place when Peter Weir’s Picnic At Hanging Rock was a main part of my Australian movie unit of my Film Studies course 12 years ago. At the time I found the film boring and frustrating. I later learnt that the story it was based on was actually fictional, not real. Something I have more recently learnt in my last two years in Australia, that not all Aussies know – and when you tell them – something they don’t want to know. That being said it is an incredible sight in a great part of rural Victoria. With the stage set in front of it, if you were far enough away or to the side of the stage you could see the iconic feature of Australia’s geology next to America’s iconic rock band. The latest, and so far the biggest, concert at the outdoor venue, the two final shows of the tour were given an extra sense of being a spectacular occasion where the band and the audience had made an effort to travel to and were in the hands of Australia’s natural elements. It was the perfect end to the tour that until the final weekend had been an indoor affair. And I even had a picnic. Making a sign with a request for Springsteen to take up was something I had previously avoided. But by Sydney 3 the urge to see one of my favourites performed had taken hold and I invested in some card and marker pens. Originally I was planning on Backstreets or Growin’ Up for a request, but having seen these two already in the line I went with Greetings From Asbury Park’s Lost In The Flood. Melbourne 1 and 2 also saw the sign brought out, and although I saw Springsteen take note of the big waving bit of card, it failed to make it to the stage. Come Melbourne 3, I had given up with the hassle of keeping the sign with me throughout the show and left it behind. So of course, track 10 for the night would be it… and needless to say, it was worth the wait. But what really made the requests one of the best highlights were those that made them. Brisbane 2’s Blinded By The Light which Springsteen did acoustically set the scene for many artistic requests to come. (Including a great one from the ‘Blinded-By-The-Light-girl’, as she became known, for Brilliant Disguise). There was Prove It All Night with the 1978 intro, Red Headed Woman where Springsteen joked Tom Morello was “shakin’ in his boots” because he had no idea what was coming and Jackson Cage to name just a few. There’s a reason why the band performed 78 different songs in 10 shows and it’s because fans on the Australia tour brought out some great requests. This song has always been a favourite live, but come the encore to Hanging Rock 1 Springsteen not only took it added it to the setlist as a request but also took on solo lead guitar duties normally expertly wielded by Lofgren. The result was a slightly heavier, raw version of the song that I had never heard or seen before. The differences may have been subtle, but at the end of the night it remained the top thing in my mind as it once again reminded fans and newcomers alike of just how skilful a guitarist Springsteen is. If there was one song that had to be selected as the unofficial anthem of the Australian tour, then for me it would have to be this. A cover version from the 1996 Blood Brothers EP/VHS release played at half of the shows it opened Brisbane 2 and became an instant classic on the tour. Not only for the crowd chanting name, but ‘Reverend’ Everett Bradley coming out front to pound the drum and Morello using his guitar lead to bring out some sounds left even Springsteen smiling. A great song that the band turned into their own especially for Australia. This one’s been in my head constantly since the tour ended. Every member of the band deserves respect for their talents, but Tom Morello’s addition to the line-up as a stand-in for the absent Steve Van Zandt brought another special element to the Australian dates of the Wrecking Ball Tour. His aforementioned talent and techniques were almost show-stopping at times. An interview during the tour revealed he had to learn around 50 songs in a few months before the first night, and it was easy to see many nights that he was focused on everything Springsteen did, (look at the top picture for this blog site to see how closely his focused) with plenty of help from Lofgren and bass master Garry W Tallent on how to keep up. But not only did he nail everything thrown at him, but when it came for him to step into the spotlight in songs like High Hopes and E Street Shuffle, he was not only a fully-fledged E Street Band member, but someone who brought in a whole new edge to the show. And when it came for his turn at Ghost Of Tom Joad, every night you would be forgiven for thinking that the song belonged to him and not Springsteen. There was never a dull moment when he was in the spotlight – he even stole a dance and showed his moves to satisfy one fan’s request in Dancing In The Dark. Yes fans of Van Zandt no doubt missed his presence, but what Australia got instead was 10 nights of – as Springsteen himself said as he stood between Morello and Lofgren – two of the greatest guitarists in the world. I’d heard about this song, and I’ve seen the bootleg clips of the 11-minute guitar over piano intro version that first surfaced on the 1978 tour and has been a part of Springsteen folklore ever since. I never thought I would get to see it, and a huge fan of the “normal” version of the song I’m happy to see and hear any format of it on the tour. But when Springsteen picked up the request during Sydney 3 for the track and special 78 Intro a wave of nervous, excitable anticipation swept through the front few rows of the crowd. Leading the band into the epic version Springsteen blasted it out to with an incredible force and passion that will be remembered for a long, long time. Signs were up at the beginning of Sydney 3 that the concert was being filmed, and instead of paper wristbands those in the pit were given shiny, silver plastic bands that look good. Which gives hope that we may see it again. Of course, those of us at the following Melbourne 1 show did get to see it again, but it was in Sydney’s final show, along with Backstreets, Growin’ Up and Trapped that it really left an incredible impression that stayed throughout the whole tour and left many Springsteen fans across the world wishing they were there to see it for themselves. Brisbane 1’s The Saints cover Just Like Fire Would, the angry, deafening version of Born In The USA, and every moment that Jake Clemons came down from the horns section to come front of the stage. Jimmy Barnes – I get how listening to someone like Jimmy Barnes when you’re in the pub with your mates and you’ve had a few beers can be enjoyable. I’ll even go on record to say he had a few good songs and sang a few lines well. But ultimately the Hanging Rock show invite to Barnes felt like a token gesture to include an Australian rocker on the bill with a world-famous act just to try and show people that Australia too has a hard-working rockstar. It may have been a great moment for Barnes fans, but for anyone else having him join Springsteen for Tougher Than The Rest was just painful. Painful because it was a good song from an album not strongly represented on the tour and because it should have been an iconic moment of the tour. Instead we had the band almost taking a break as Springsteen gave a subdued performance with Barnes looking like he was struggling to keep up with one of the more simpler tracks on the setlist. Hanging Rock 2 seemed like they had turned Barnes microphone down a notch, but he still wailed over Springsteen’s harmonica to bring a rare lull to an E Street show. Many Australians won’t agree as fans of Barnes will refer to him as ‘Australia’s answer to Springsteen’… but he’s not. If anything Barnes is Australia’s answer to MeatLoaf… Possibly even Grand Final MeatLoaf. Waitin’ On A Sunny Day – I don’t have a problem with Springsteen pulling up kids for a sing-a-long. Most nights it worked well and was enjoyable, but after maybe five shows I was ready to hear another song in the ten minutes or so that it takes to belt this one out. No cameras – Again, no problem with the zero-camera rule, as you don't want to be up close to the best show in the world and spend it looking through a small screen. And I understand why Nils Lofgren seemed to turn away after I took a few pics of him on my phone, but to be jumped on by security in Melbourne 2 every time I took it out my pocket was ridiculous. In contrast, security guy in Brisbane 2 was clear before the show started by telling those of us close to barrier that we could take quick photos on our phones, but don’t piss off anyone by holding it up for 10 minutes at a time to shoot videos. No Perth show – The new arena is crying out for Springsteen and every fan knows it, so the fact he didn’t come here is a disappointment. But then again, if WA is on the radar next time, I and hundreds of other Perth fans will still travel over east to see every show. Feel free to leave a comment below and share your highlights of the tour! Agree with your list...for the most part. The signs/requests have come to be a major annoyance at shows..it's been going on for a long time. Problem is not what people ask for, it's the fact they hold up their large signs even when Bruce is turned away...very annoying. So I would have to put the signs as a lowlight..but Bruce choosing requests is always OK. Sunny Day, definite low light...kids are cute and all..but this is an adults rock show...kids under 12 really don't belong..esp when the parents put them on their shoulders so Bruce can see them...grrrrrrrrrrrr. Thanks for the blog..I"ll vote for you for sure! Totally agree with you and the signs - I like them, but only hold them up at the right time. I got stuck behind one in Sydney and got tired of seeing it up all the time. Great work dancing with Tom too! I would have put in a pic of that but didn't get one! I took my camera into the Sydney shows. All the info I had said no professional cameras (which means those with detactable lens). The security in the Sydney pit were great, only saying we shouldn't be videoing, but photos were fine. Sydney and Brisbane security were pretty relaxed and easy going, it was Melbourne that seemed to have a serious attitude problem. With the exception of the guy who came out everyday to check the line and make sure we could get to the water! I think you need to add one more highlight......Jungleland, Sydney 2. Tom Morello nailed the guitar solo here. 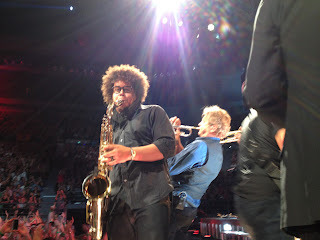 And to get Jungleland again at Melbourne 3 was just incredible. These Austalian shows were far better than the California ones - signs - bit over them. Seems Bruce only takes the signs he wants and from what I seen if you have a sign 1 night - they play it the next, that happened a few times. Love Bruce and love being able to share my love with other Bruce fans!!! Love the enthusiasm and excitement of your comment Kim - thanks for reading! Great list!!!!! still blinded by the light *_* dont think my eyes will ever be the same again. Ha! I meant to ask your name after the photo in Sydney as I wanted to mention your awesome achievements, but missed you at the end! Did I see you in the line for one of the Hanging Rock shows too? How many did you make it to in the end?! Most incredible life-changing moment was the few stark lines of We Are Alive, from 'my body gone stone cold' - that whole song took my mid-life crisis and dumped it on its arse! Life will never be the same post-Springsteen concert!